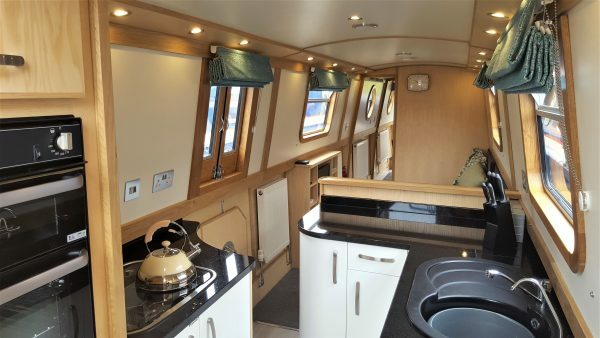 This luxury 58ft narrowboat, is of a reverse layout design, proving to be our most popular and sociable layout. The interior is of a modern design that has a bright, contemporary and luxurious look and feel. 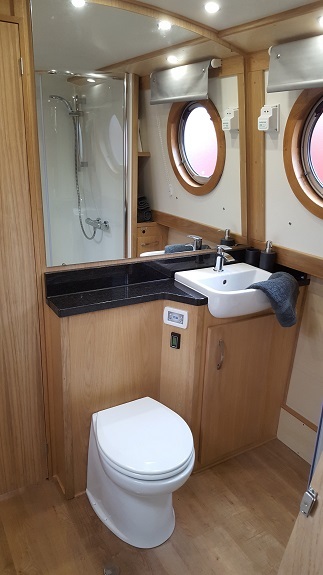 Internally at the bow there is a cabin with a kingsize crossbed with wardrobes either side; a partition doorway leads to a small corridor off which is the bathroom with a full size shower cubicle, macerator toilet and basin with granite worktops. 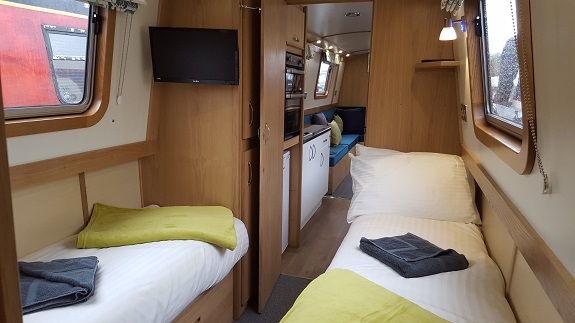 A further partition door leads into the centre cabin with twin beds that can be converted to one double, this cabin has an additional TV/DVD player and a full size wardrobe. A door leads you through to a beautiful galley area with granite worktops. The area is equipped with full size fridge as well as an oven, hob, microwave. 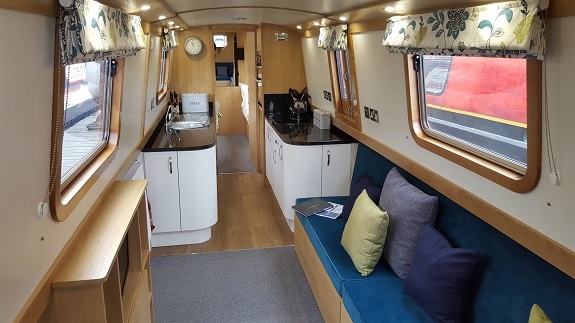 The saloon area has a large sofa with TV/DVD/CD/Radio, tables can be added to adapt into a dining area, plus the seating can be transformed to make a double bed. 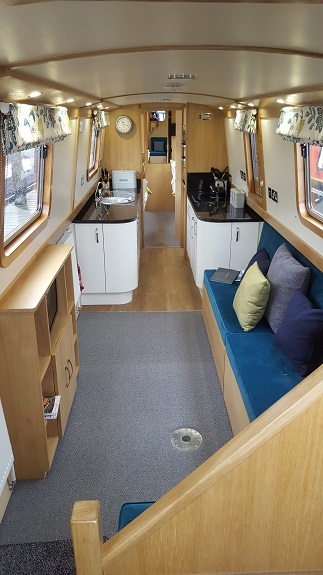 Sweeping stairs take you up onto the semi cruiser stern, this has two large lockers creating a lovely area to relax and chat whilst cruising. 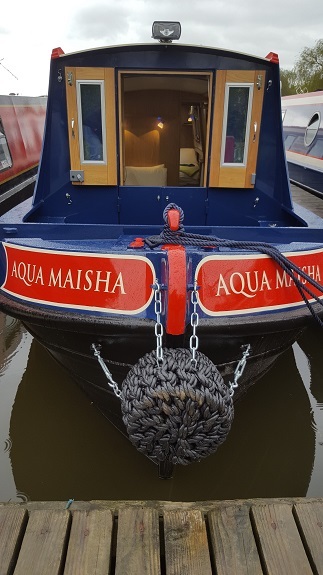 All our boats are centrally heated have 230v mains power and the engines are fitted with hospital silencers, to ensure a quieter and more refined cruise. This boat is pet free. 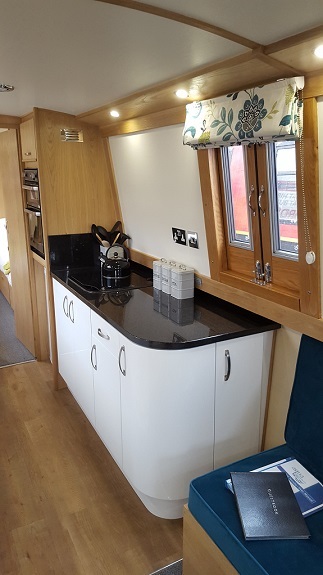 This luxury 58ft narrowboat, built in 2018, continues on with our proven formula for style and quality. The interior is of a modern design that has a bright, contemporary and luxurious look and feel. Internally at the bow there is a cabin with a kingsize cross bed (5ft wide x 6’1” long) with wardrobes either side; a partition doorway leads to a small corridor off which is the bathroom with a full size shower cubicle, macerator toilet and granite worktops. 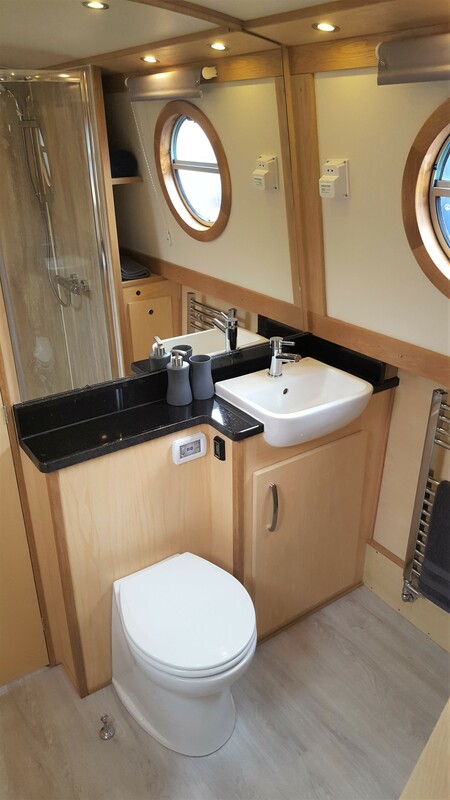 Exiting the bathroom a further partition leads in the centre cabin with twin beds that can be converted to one double, this cabin has an additional TV/DVD player and a full size wardrobe. A door leads through to the saloon, this consists of a large L shaped sofa with storage under, opposite is a cabinet containing the TV/DVD/CD/Radio, tables can be added to adapt into a dining area, plus the seating can be transformed to make a double bed. 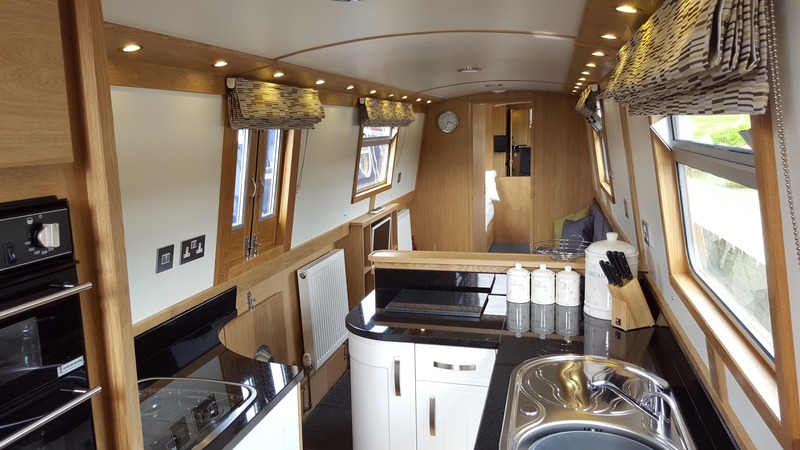 At the stern is the beautiful galley area with granite worktops. The area is equipped with a full size fridge as well as an oven, hob, microwave. 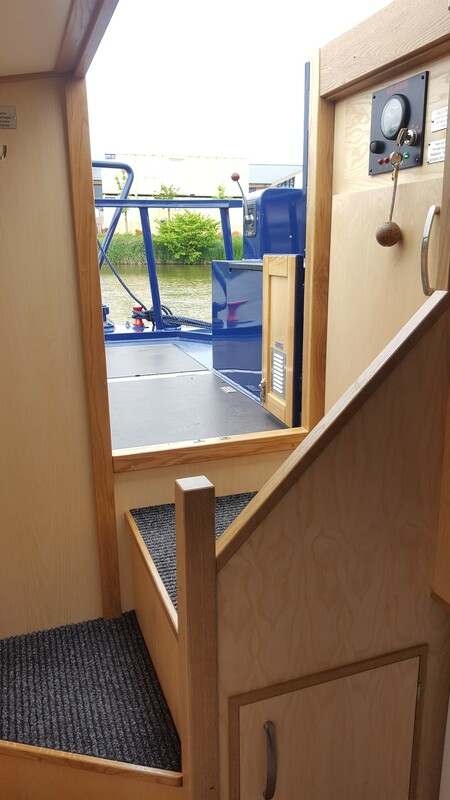 This boat features a straight set of stairs (not ladder steps) out onto the stern deck, as opposed to our normal sweeping stairs. This provides additional worktop space but also allows for the creation of a full height, heated locker for coats etc. The steps also contain additional storage for shoes and coats etc. 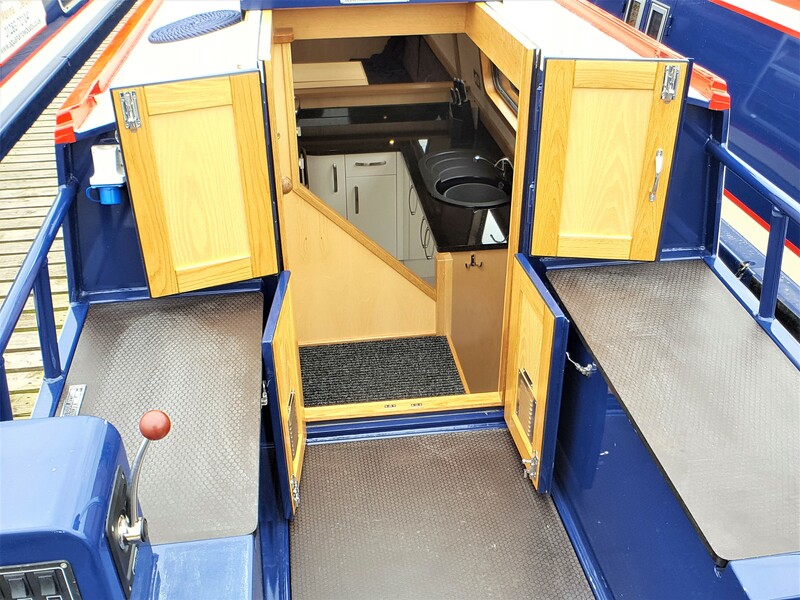 The semi-cruiser stern deck has two large seat lockers creating a lovely area to relax and chat whilst cruising. 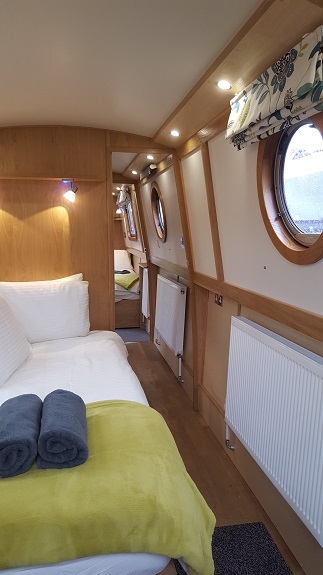 All our boats are centrally heated, have 230v mains power and the engines are fitted with hospital silencers, to ensure a quieter and more refined cruise. 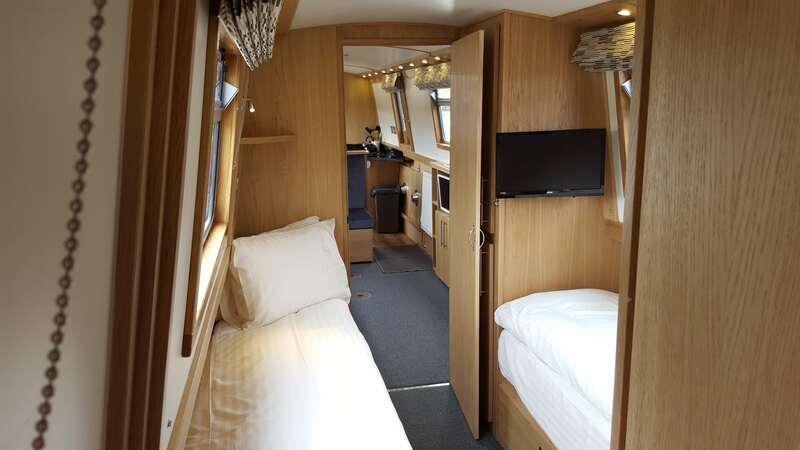 A contemporary and superior 60ft narrowboat of reverse layout design. The interior has a bright and luxurious look and feel. 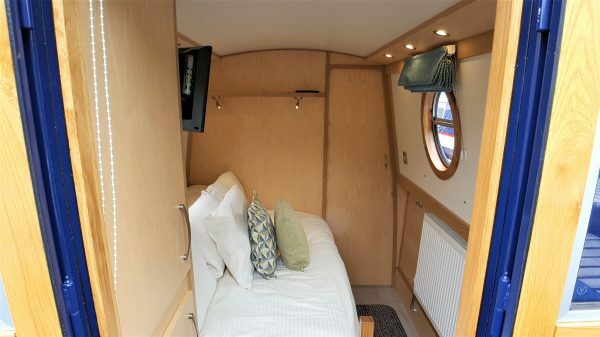 At the bow there is a cabin with an extending kingsize bed (5ft wide x 6’1″ long) and wardrobes either side. 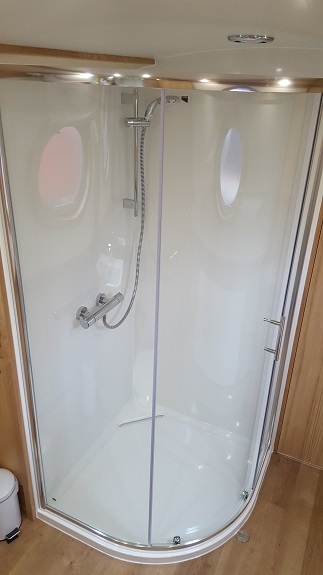 A partition doorway leads straight into the walkthrough bathroom with a full size quadrant shower cubicle, macerator toilet and basin with granite worktops. The centre cabin has twin beds that can be converted to one double, this cabin has an additional TV/DVD player and a full size wardrobe. 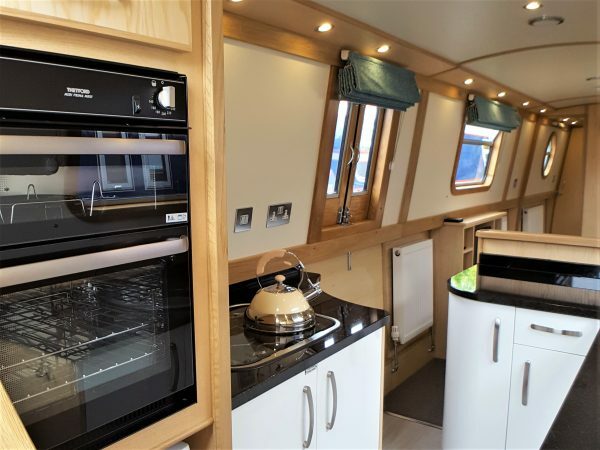 The beautiful galley area, with granite worktops, is equipped with a full size fridge as well as an oven, hob and microwave. 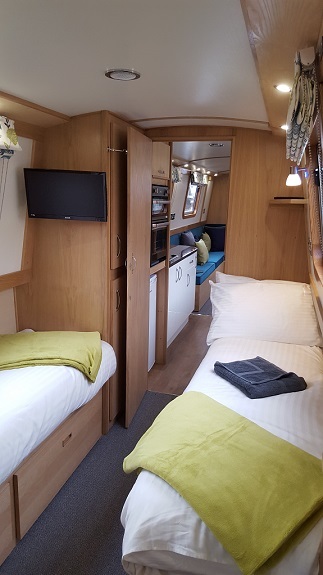 The saloon has a large sofa with TV/DVD/CD/Radio, tables can be added to adapt into a dining area, plus the seating can be transformed to make a double or twin beds to sleep 2 extra people. 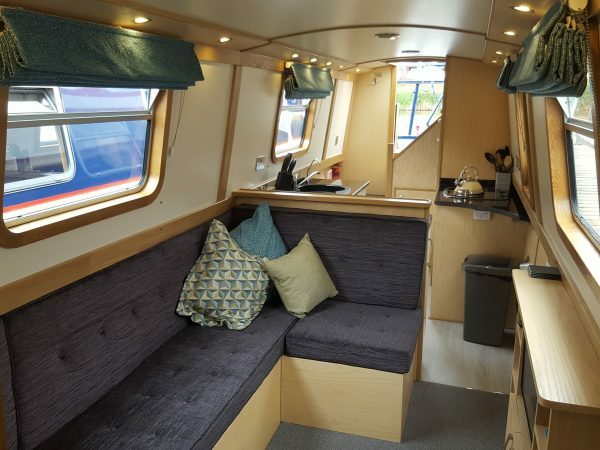 Outdoors, this semi cruiser stern has two large seat lockers creating a lovely area to relax and chat whilst cruising. 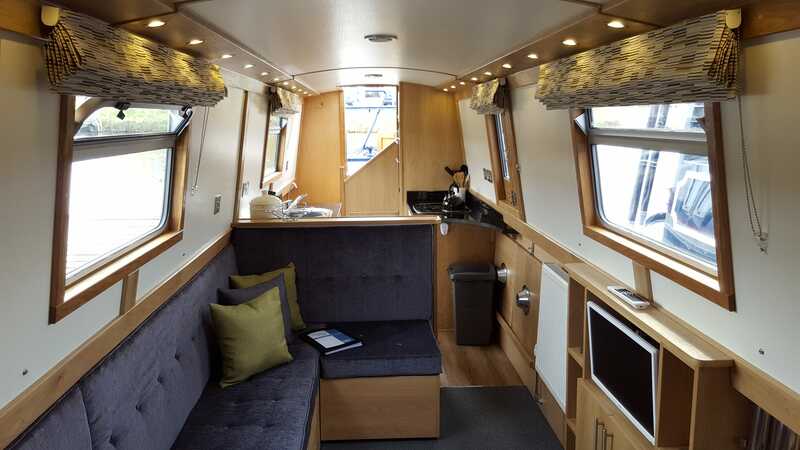 A contemporary and luxurious 50ft narrowboat. 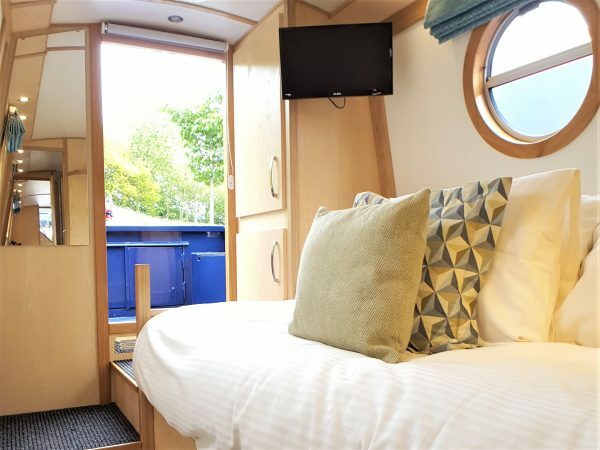 This cosy narrowboat offers a permanent double bed (extending to 4’ 9”), walkthrough bathroom with toilet, shower and basin set in granite worktops. 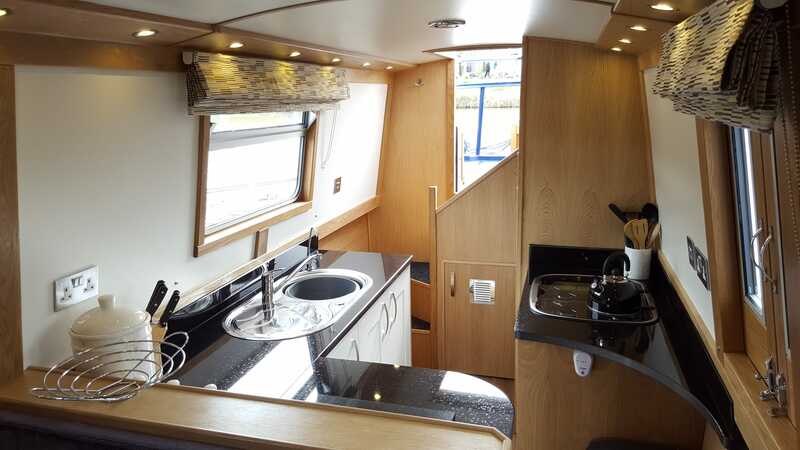 The beautiful galley also has granite work surfaces and is fully equipped with fridge, hob, oven and microwave. The saloon has a large sofa where tables can be added to adapt into a dining area. The seating can also be adapted to create an additional area for sleeping 2 people. This luxury 58ft narrowboat, built in 2016, is a reverse layout design, proving to be our most popular and sociable layout . 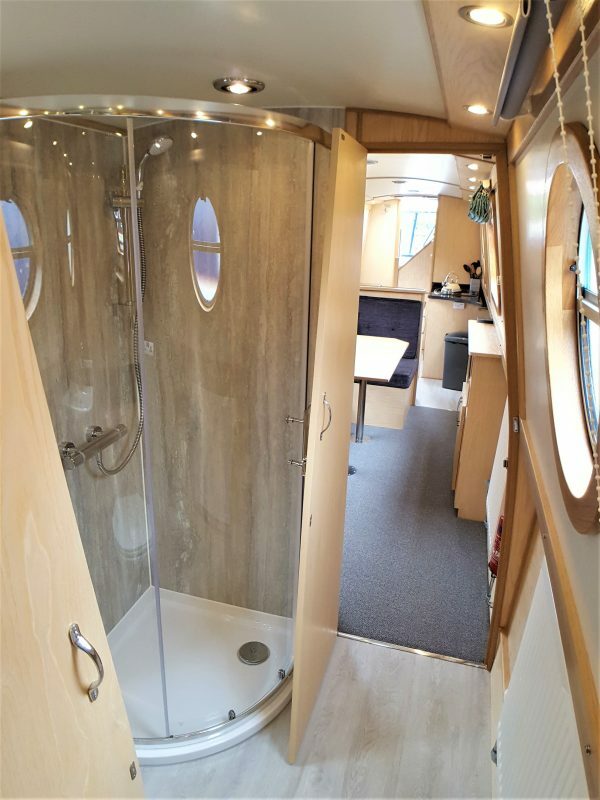 Internally there is a permanent king size cross bed in bow cabin, followed by a bathroom with a basin, toilet and shower. Midship is a permanent twin cabin that can convert to a double on request. Both bedrooms and bathroom have partition doors for greater privacy. The saloon has a large L shaped dinette/ settee converting to either two singles or a double if needed. 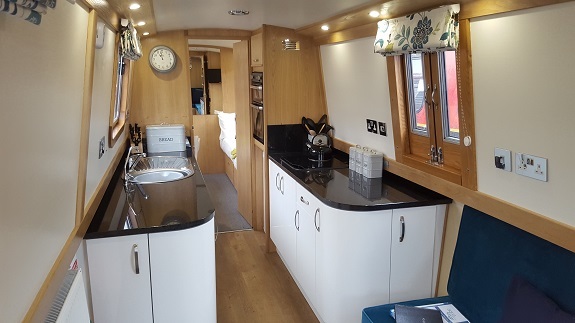 At the stern there is a beautiful galley area with granite worktops, a full size fridge as well as oven, hob, microwave and kettle. TV/DVD units are provided in the twin bedroom and the saloon. 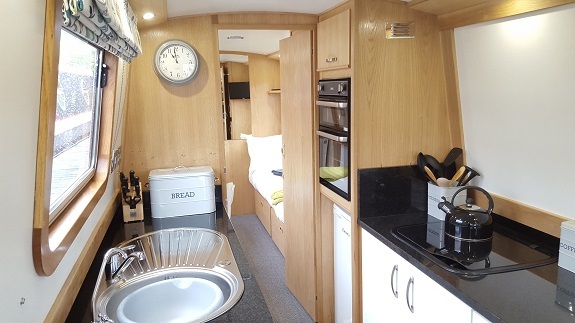 Both bedrooms have wardrobes, additional storage is available under the large L shaped dinette. 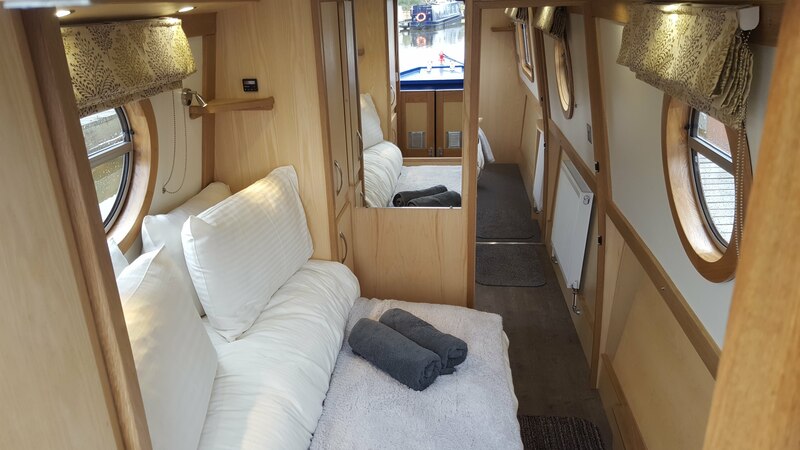 The interior of the boat is of a superior design with a modern, contemporary and luxurious look and feel. 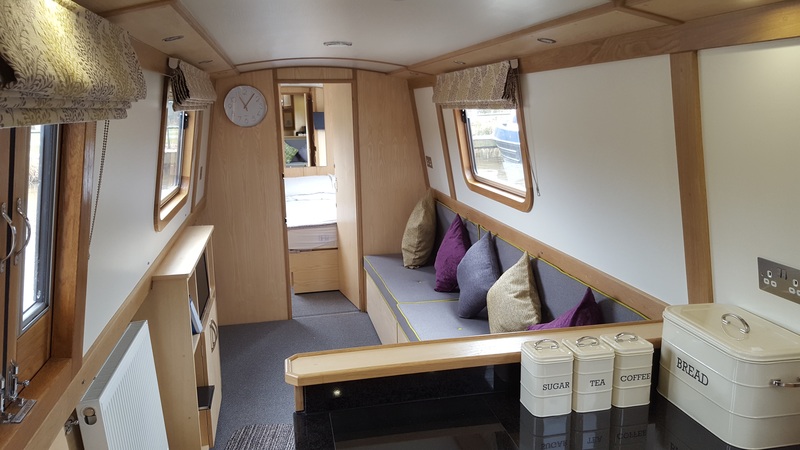 The semi cruiser stern has two large lockers creating a lovely area to relax and chat whilst cruising. 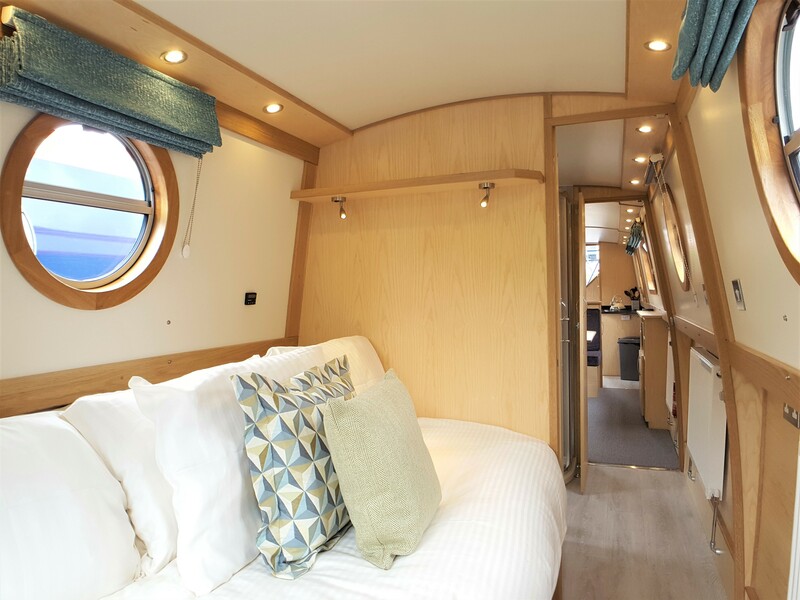 All our boats are centrally heated and the engines are fitted with hospital silencers, to ensure a quieter and more refined cruise, in addition Beatha has double glazed windows. Your luxury narrowboat hire & holiday will start from our base at Barton Turns Marina, on the Trent and Mersey Canal offering many canal routes such as the Four Counties Ring, Leicester Ring and Black Country Ring. You will be met by one of our friendly handover staff, who will guide you to your parking space and narrowboat. 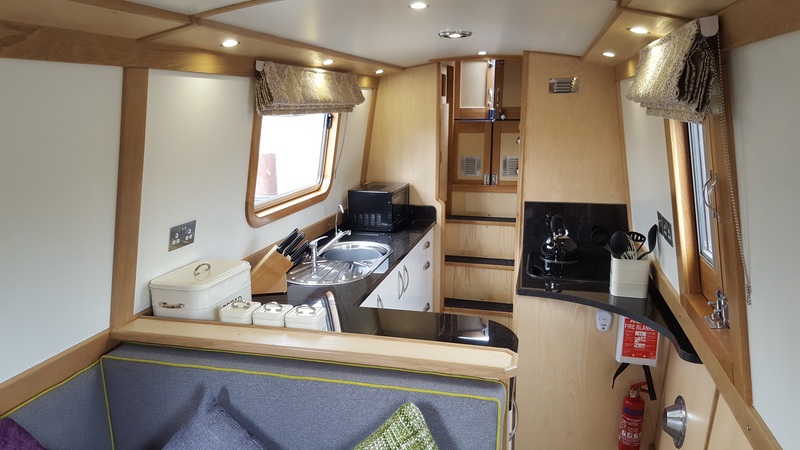 Once you have unpacked (& have started on your complimentary cake) you will have a demonstration of the boat facilities & the skipper will get boating tuition until fully confident. Hire of your chosen 5 star narrowboat for the allocated time. 1 set of bed linen and duvets per berth booked – additional linen can be hired. Welcome pack of tea, coffee and milk and home-made cake on arrival. Hygiene products including starter pack of toilet roll, washing up liquid, dish cloths and tea towels. Free parking for up to 2 cars. Free boating tuition as part of the handover. Gas bottle on board the boat. We can also organise surprise gifts if you require. Compulsory extras that will need adding to your holiday price: a damage waiver fee of £55 and a fuel contribution of £10 per night. 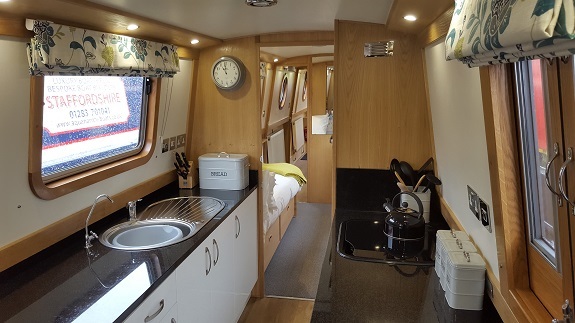 Bookings require a 20% deposit, the remaining balance is due 6 weeks before your narrowboat holiday or experience commences. You are able to pay by cheque, credit card or debit card. 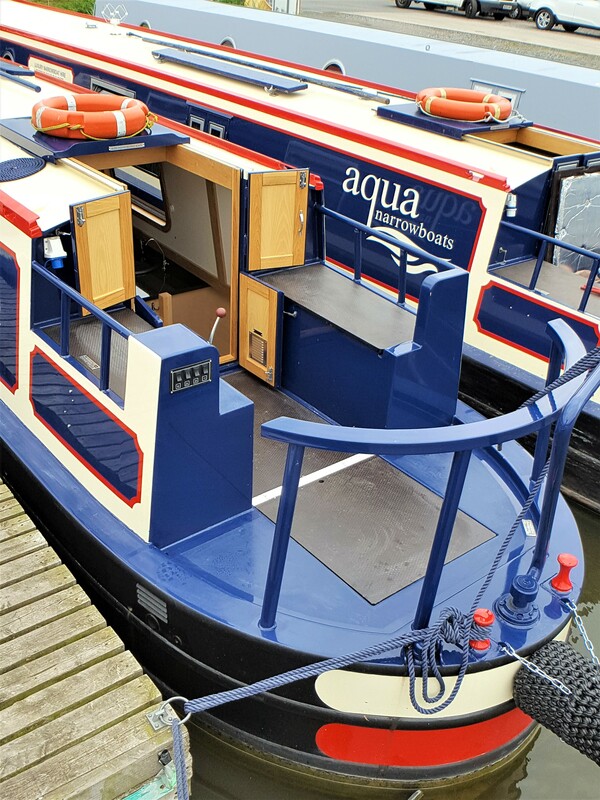 Please make cheques payable to Aqua Narrowboats (UK) Ltd and add your invoice number, holiday date and surname on the back and send to our Headquarters: Aqua Narrowboats, The Boat House, Tomlinson Business Park, Woodyard Lane, Foston, Derbyshire, DE65 5BU. Before booking please read the narrowboat hire terms and conditions and Frequently Asked Questions. Online: Click book online and follow the guidance provided. 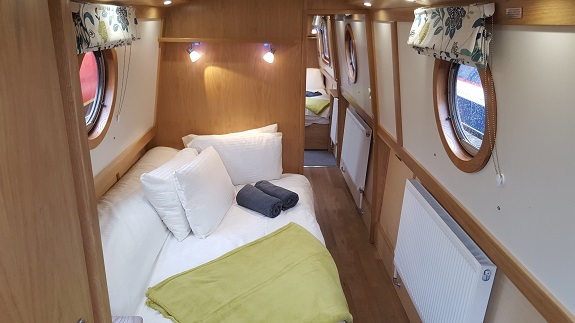 By email or phone: You can check availability and book by emailing: info@aquanarrowboats.co.uk, or phone 01283 585718. A 20% deposit is required to confirm a booking. Directions to Aqua Narrowboats (on Trent and Mersey Canal) at Barton Turns Marina, Barton Turn, Barton under Needwood, Staffordshire, DE13 8DZ. Airports & Railways – we are situated 30 minutes drive from East Midlands Airport and the nearest train station is Lichfield Trent Valley or Burton-on-Trent served by Birmingham New Street & Derby Railway Stations. For rail times and connections visit National Rail. Should you lose your way please do not hesitate to contact Justin on mobile number 07786 988397. Please note the Mercia workshop will no longer be staffed on a Saturday so please call the mobile number. Upon arrival follow the A board sign towards the Tea Room and Reception where you will be met by one of our friendly handover staff who will guide you to your parking space and narrowboat. There is a Morrison’s store just under 4 miles away (post code: DE14 2AR) for grocery shopping with free parking. Should you arrive early there is also a number of shops, a tea room, café, and a bar bistro on site – See the main marina website www.bartonmarina.co.uk. 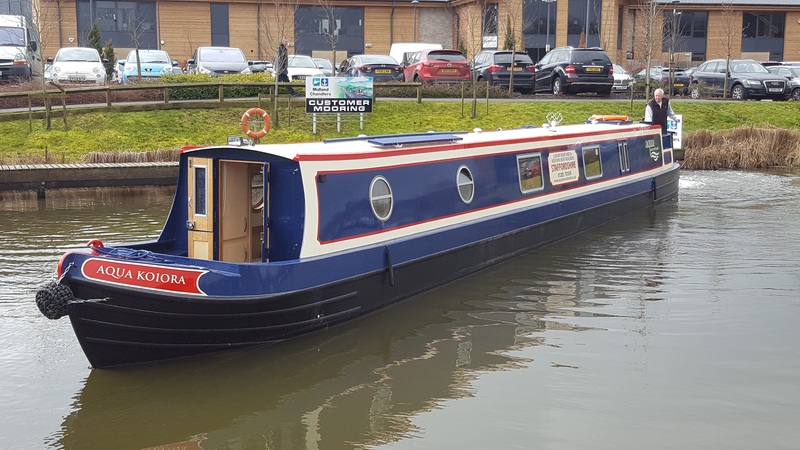 The confirmation of a narrow boat booking will be given once the fully completed booking form along with a deposit of 20% of the total price has been received by Aqua Narrowboats (UK) Ltd. 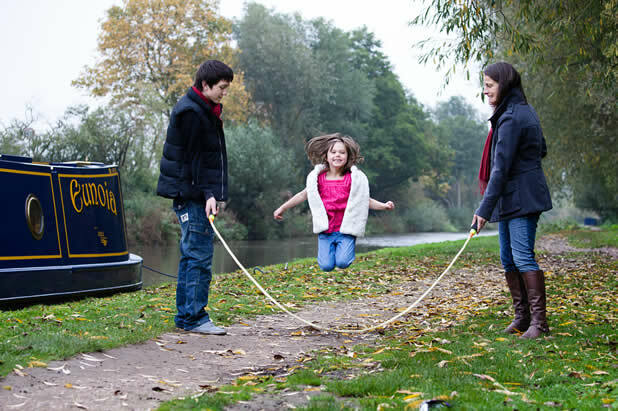 The hirer will then be responsible for paying the full balance at least 6 weeks prior to the start date of their narrow boat holiday. This compulsory scheme ensures that for a single, non-refundable premium (see ‘What’s Included’ page for current charge) you will be protected from any liability for damage/loss or accident to your boat or its inventory during your holiday period. The premium will be shown on your booking confirmation along with the final balance of hire. We allow pets on board all our boats for an additional charge (please see ‘What’s Included’ page). All pets must be kept off beds, seating and soft furnishings. We ask that owners bring with them blankets/bedding for their pets to sleep on. 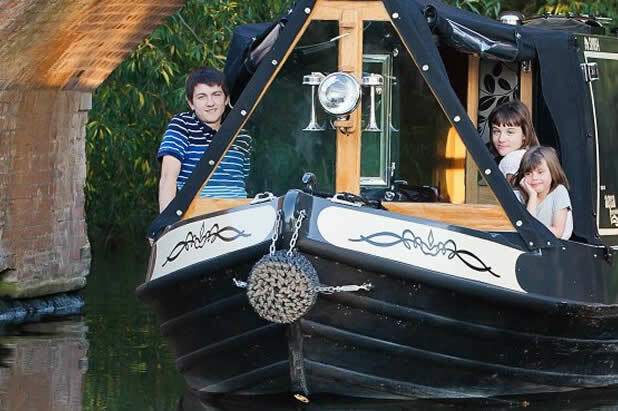 When is the best time to book our narrowboat holidays to get the best value? Booking early always gives you the best value. We run an offer from April through to September offering 25% off if you book 12 months in advance and 15% for 9 months. This discount applies to a maximum of 2 weeks at a time. 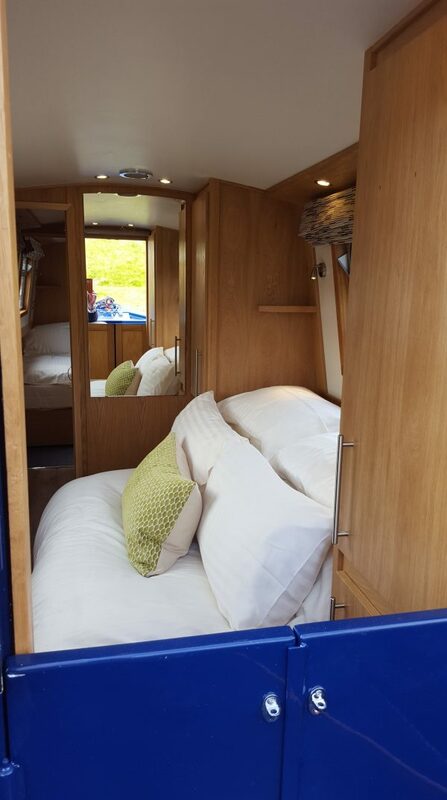 The booking can be made on any narrowboat holiday at any time of year, so is most popular with school holidays. Therefore, booking 12 months in advance will give you the best deal. Special offers, ‘Deal of the week’ and competitions can be found via our special offers page, on Twitter and Facebook. You can either just keep track of one of these pages or sign up to our e-newsletter and get offers sent to you every month. We love to hear from our customers so do connect with us via your favourite site. 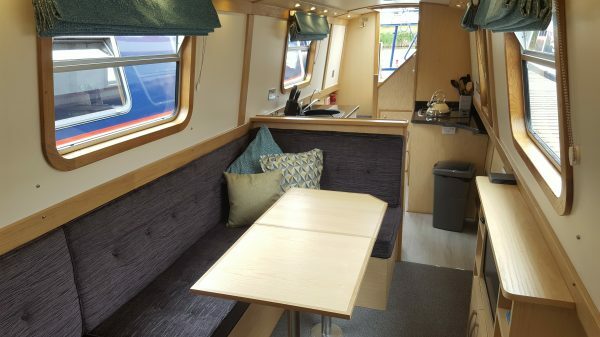 Can I see more interior photos of the narrowboats for hire? 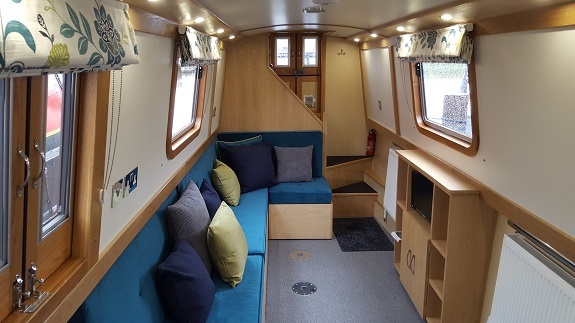 Yes there are plenty of interior photos of the narrowboats for hire on the ‘our boats’ section of the website. You can also see more photos on Facebook and there are also some short videos of each of our narrowboats for hire on youtube. Are the canals open all year round? No, canals undergo a maintenance programme over the winter season from about mid October to the end of March. The programme can be viewed online at the Canal and River Trust so you can see if any stoppages will effect your narrowboat holiday. Occassionally work also needs to be carried out during the holiday season due to emergency such as flooding or lock damage. Again check with the Canal and River Trust before you set off for any last minute stoppages. Can I bring electrical items with me onboard my narrowboat? The system on board is a 240v system so does operate a number of electrical items. However we ask that no other electrical items are brought without the prior consent of Aqua Narrowboats. The electrical items already provided onboard include: hairdryer, mircrowave, TV, stereo and fridge. The oven and hob are gas operated and a whistling kettle is heated via the gas hob. Mobile phones can be plugged in and charged with no problem at all, we recommend doing this whilst cruising as the engine is generating power. Do I get any boat handling tuition before my canal boat holidays? Can I go on the river on my canal boat holidays? Yes if you are an experienced narrowboater, then you are able to go along the river section on your canal boat holidays, please speak with the team at Aqua Narrowboats first so we can ensure you have an anchor onboard. 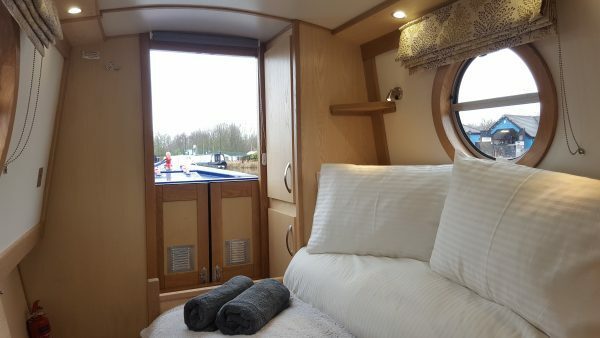 Can my canal boat holidays be longer than 2 weeks? Yes we are happy to book canal boat holidays up to 3 weeks. We don’t usually take bookings for a longer period than this. The shortest period we book for is a 3 night short break from Saturday to Tuesday, or you can book a short break Tuesday to Saturday. What happens if my canal boat breaks down? It is unlikely that your canal boat will break down as we maintain our narrowboats to the highest standard. However if this does happen, or you are concerned about anything whilst onboard you can call the office during opening times Tel 01283 585718 or the marine repairs team on a mobile phone number provided within your boat handbook. Your marine engineer will assess your situation via the phone, in many cases the problem is resolved at this stage. If the problem is not resolved a marine engineer will visit your canal boat as soon as possible. There are no charges for a marine engineer callout unless in connection with a toilet blockage which is caused by misuse ie wipes blocking the toilet. Please see our terms and conditions for further details. Are there many canal routes to choose from for my canal boat holidays? There are lots of canal routes to choose from as we are based in the heart of the Midland canal network. 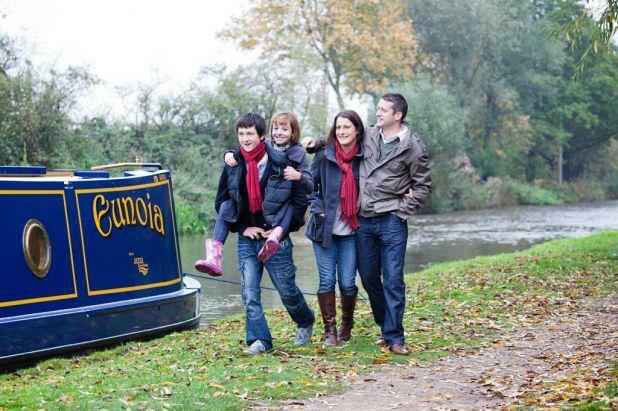 If your canal boat holidays is one or 2 weeks long then you can choose from many of the canal rings on the system including the Staffordshire Ring, Four Counties Ring and Leicestershire Ring. For canal boat holidays of less than a week, then you can discover the Trent and Mersey canal up to Great Haywood and back visiting Shugborough Hall, Fradley Junction and the pretty village of Alrewas. See our canal routes page for ideas. 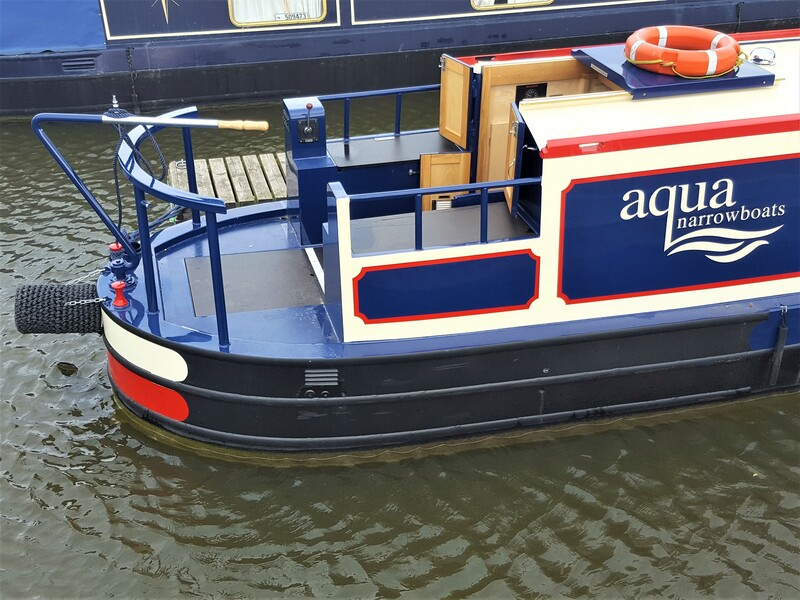 Where is Aqua Narrowboats based? 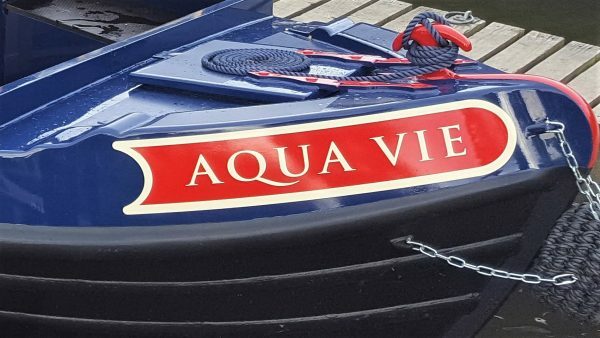 Aqua Narrowboats is based at Barton Turns Marina on the Trent and Mersey Canal. For directions to our base please see our ‘find us’ page. Can I cancel my canal boat holiday once booked? Please see our terms and conditions about cancelling your canal boat holiday. 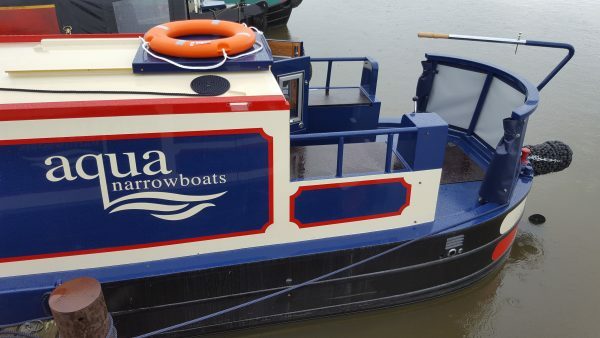 How many narrowboats does Aqua Narrowboats have? At the moment we have 6 narrowboats for hire, all awarded 5 stars from VisitEngland. These are all based at Barton Turns Marina, Staffordshire, on the Trent and Mersey Canal. 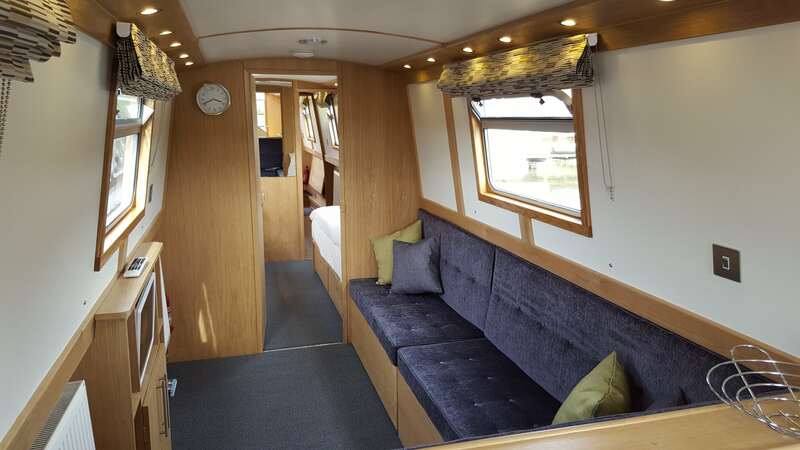 Can I bring extra people on my luxury canal boat holidays? You need to add the details of all the people who will be joining your narrowboat holiday when booking, even if they will be joining for only part of the holiday. The maximum number of people at any one time should not exceed the stated limit, therefore if the boat is a 4-6 berth, the max is 6 people, if it is a 2-4 berth the max number is 4 people. For safety and insurance reasons we cannot exceed this limit. 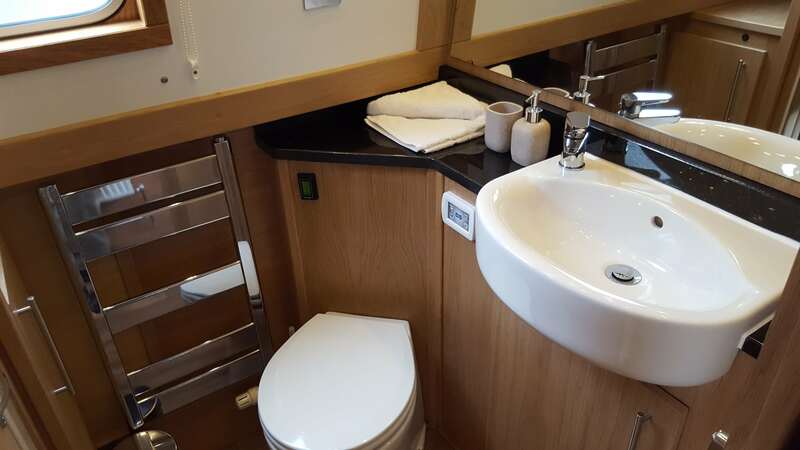 How easy are the narrowboats to get on and off? 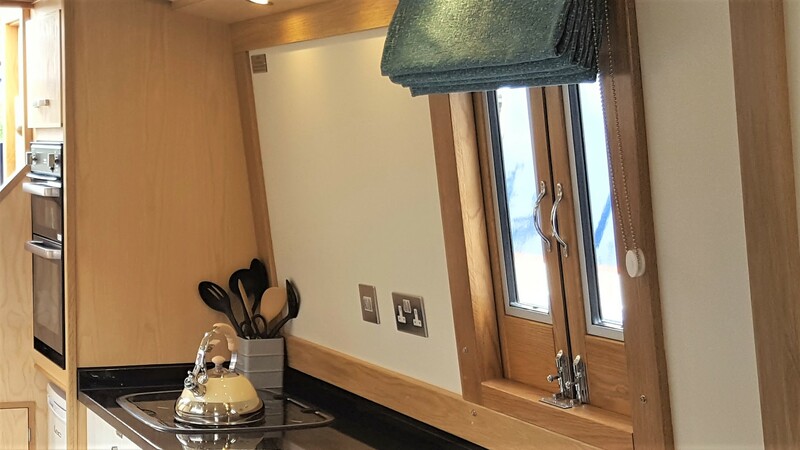 We have an accessibility statement that may help you decide if you are mobile enough for a narrowboat holiday. 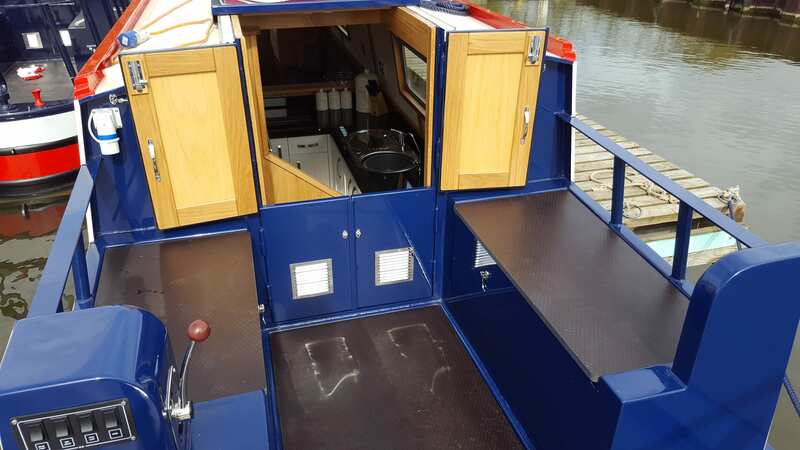 Our narrowboats have been particularly well thought out to improve access with graduating stairs & hand rails at both entrances, stable doors to improve the safety of small children and pets who can look out without being near the water; and an apron at the rear. You are welcome to arrange a visit to take a look at the narrowboats before booking your narrowboat holiday. 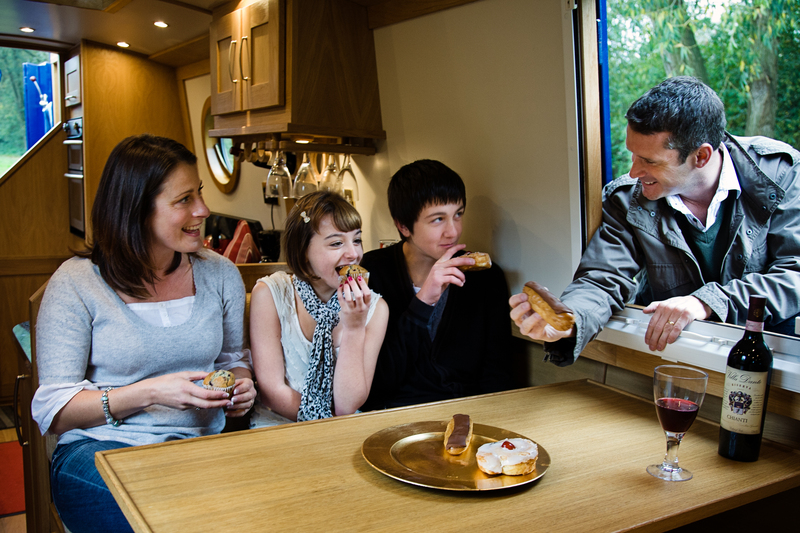 Do I need to bring food on my narrowboat holidays? Yes, enough food for a couple of days, remember storage on board a narrowboat is limited. We do provide a welcome pack of tea/ coffee and milk on arrival, plus a home made cake. There are places where you can buy food nearby Barton Turns Marina including a Morrison’s just under 4 miles away (DE14 2AR). There are many places to shop as you are cruising along the canals and many of our guests like to eat out at the many pubs, restaurants and tea rooms as part of their narrowboat holidays. Recommendations can be found in the visitor books onboard the narrowboats. What will I need to bring on my luxury canal boat holidays? You will need to bring your clothing, be sure to pack a variety of warm and cool clothing as the weather can change throughout the week, waterproofs are especially useful as a narrowboat holiday is very much outdoors. Suncream is an essential item even if it doesn’t look sunny you can easily get burned when cruising along. Binoculars can be useful for spotting birds along the canals, a torch can be useful although there are some onboard too and a camera for capturing the memory of your narrowboat holidays. You will also need to bring enough food to last a couple of days. Lastly good footwear such as walking boots is best, but wellies or other good walking shoes are also suitable. Can I bring a bike on my narrowboat holidays? If you would like to bring a bike, please contact us first to discuss arrangements. It very much depends on the capacity of people onboard and your security arrangements. If we do agree please be aware that you are bringing your bike at your own risk. Can I bring along a pet on my narrowboat holidays? Yes, pets are welcome on most of our narrowboats at a charge of £40 for one pet or £60 for 2 pets. We ask that you bring your pets own bedding and ensure they don’t go on the beds or seating. Pets are not allowed on Aqua Te Ora. 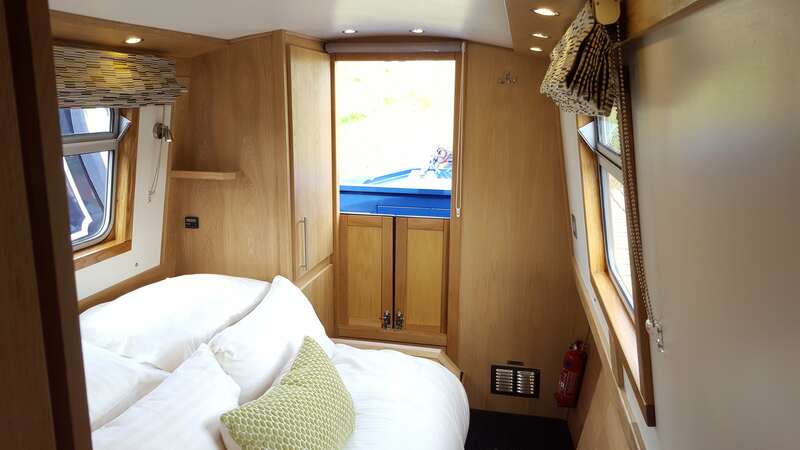 What’s included in the price of my narrowboat hire? The price shown online includes the hire of your narrowboat, all bed linen and duvets, towels, a welcome pack of tea/coffee/milk and hygiene products (washing up liquid, hand soap, toilet paper, dish cloths and tea towels), a home made cake on arrival, gas for the duration of your narrowboat hire, free parking for up to 2 cars and free boating tuition as part of the handover. What time does my luxury canal boat hire period start and end? Your narrowboat hire period starts from 3pm on your collection day, unless you have paid for early cruising as an optional extra, in which case you can collect at 1pm. All narrowboats need to be disembarked by 9am on your day of departure. The map opposite can be used to help you plan your canal boat trip. Attractions: Fradley Junction Nature reserve, Shugborough Estate, Stoke-on-Trent Potteries. Attractions: Shardlow Heritage Centre, Leicester City, Foxton Locks Staircase. Caldon canal to froghall winding hole & Return (blue route). Distance 106 miles & 94 locks, cruising 10 days. Attractions: Shugborough Estate, Stoke-on-Trent Potteries, Churnet Steam Railway. Ashby canal bridge No 7 & Return (green route). Distance 135 miles & 74 locks, cruising 10 days. Attractions: Fradley Nature Reserve, Drayton Manor Park, Bosworth Battlefields. From our base at Barton Turns Marina on the Trent and Mersey Canal, there is a wealth of canal networks to choose from. 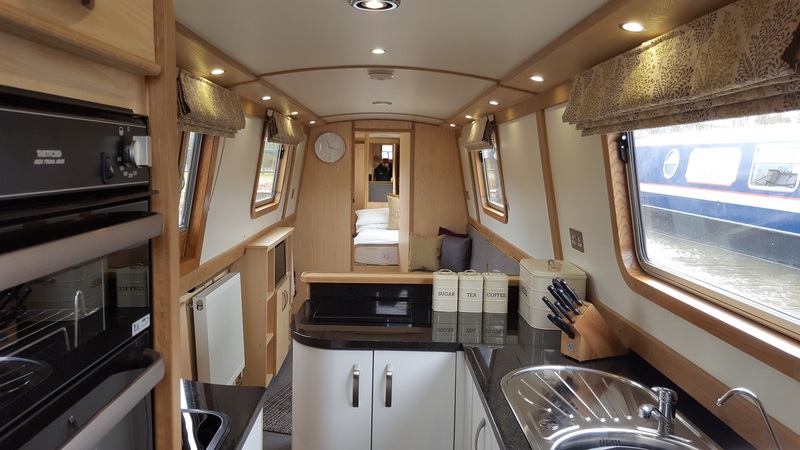 Aqua Narrowboats is based on the Trent & Mersey Canal at Barton Turns Marina between the brewing town of Burton and approximately 3.5 hours cruise from the inviting pub, tea rooms and nature reserve at Fradley Junction (the meeting point of the Trent and Mersey and Coventry canals). An ideal location for your canal boat holiday hire. We are ideally situated for you to choose from a wealth of canal boat cruises including: the Black Country Ring, Four Counties Ring and Leicester Ring. 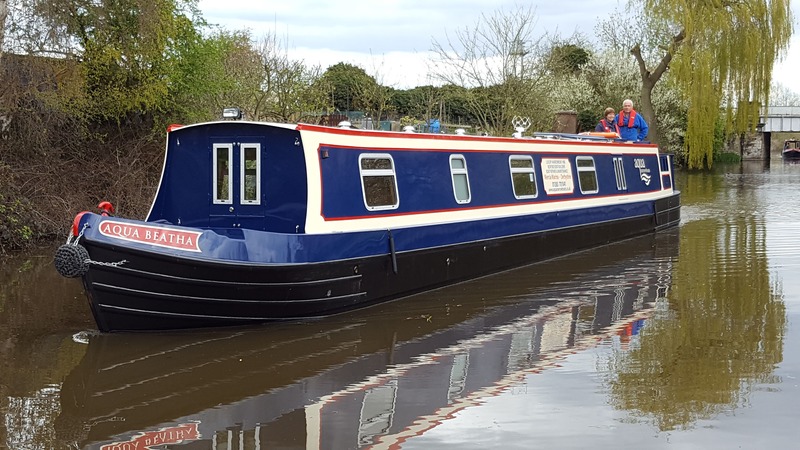 Return routes include the picturesque trip to Great Haywood passing Fradley Junction; alternatively you could attempt the 11 locks at Atherstone on the Coventry Canal; or take the children to Drayton Manor Park along the Birmingham and Fazeley Canal. We also provide Collins Nicholson Waterway Guides on board the boats. These guides are similar to a road atlas but for canals – as well as illustrating each section of canal they also provide information on bridge and lock numbers, boatyards, refuse and water points, mooring locations, water hazards, shops, pubs and grocery stores and finally, areas of local interest. If you wish to plan ahead these can be purchased via Amazon – our base is covered in Guides No 3 & 4 (this will be dependent on your route). At Great Hayward on the Trent and Mersey Canal. Pat and Colin Hassall recommend this as ‘well worth a visit’. On the Birmingham and Fazley Canal. Recommended by us. Our three children love the park as it caters for the younger children with Thomas Land and the teenagers with the white knuckle rides. There is even a zoo for some peace and tranquility. On the Trent and Mersey Canal. Ian and Julie Cresswell says this ‘is an amazing experience’. On the Trent and Mersey Canal. Including Wedgewood, a driving force behind the construction of the Trent and Mersey Canal in 1777. In Birmingham on the Birmingham Canal Navigation. On the Ashby Canal. The site of the Battle of Bosworth in 1485 and the infamous place where King Richard III lost his life. At Barton Turns Marina. Light meals and cakes, plus breakfast menu. A great stop off if you arrive for your canal boat holiday early or to have breakfast before you leave. Recommended by us! Fabulously designed pub overlooking Barton Turns Marina offers a range of traditional pub meals. An authentic Thai food restaurant at Barton Turns Marina, again offers great views of the marina. At Stone. A very good Italian, not cheap but good value. Recommended by Graham and Lyn Precious. At Alrewas. Peter and Lynda Wagner rated this pub as ‘excellent’. 5 mins walk from Bridge 70. Peter and Lynda Wagner rated this pub as ‘very nice’.